Clearaudio introduces Concept MC cartridge | What Hi-Fi? 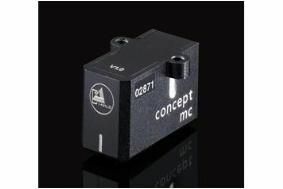 The latest addition to its line-up is this, the Concept MC cartridge, said to provide "the level of performance for which Clearaudio moving coil cartridges are renowned for the lowest ever cost". So how much would that be? £550. For that you get a cartridge body made of aluminium magnesium alloy with a ceramic surface layer, Boron cantilever material, oxygen-free copper coil and a Micro Line Contact stylus. Clearaudio cartridges are distributed in the UK by Audio Reference.